Shortly after the Centers for Disease Control and Prevention, CDC, announced they had a plan for a future zombie crisis, some slept easier at night. However, the CDC was unable to reassure the scientific community after their "zombie survival kit" consisted of nothing more than supplies to promote isolation (CDC.gov). The community realized the flaws in the plan as outbreaks became a reality. Families were torn apart by the CDC as they quarantined entire areas to isolate the outbreak, yet their plans proved to be far from fail proof as the avian population began spreading the virus to areas outside of the quarantine zones. It was a matter of time before survivor's resources were depleted and they risked their lives to gather food and water. Nearly 95% of all attempts to acquire supplies ended in death or the acquiring the reanimation infection (Zombie gone). It was for this reason that we a small group of armature scientists in Oregon began to isolate the "reanimation virus" in hopes of finding a cure. Unfortunately research has found the virus to remain alive outside of the host for 2-4 weeks at a time and mutate when a anti-viral is introduced. In one study, the scientists observed that the infected may only survive without feeding of the host for 4 weeks at which time the virus is unable to maintain structure of tendons and ligaments, leaving them immobile and vulnerable (Zombie Gone). 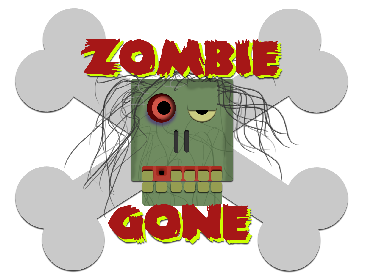 Copyright © 2011, Zombie Gone, all rights reserved.